How to take Cloud Backup from major cloud services and FTP. When you are using cloud storage you are keeping all your documents and files on remote server and accessing them at your end. You are even adding all your files day by day which is getting synced up. The future of cloud technology is proving the usage of the cloud technology in daily basis. The files are available anytime anywhere just with the help of Internet. Related Post: Better cloud storage options than Dropbox. Cloud Technology is taking the world in a new phase which runs, stores and access files on clouds. Being fully dependent on only one cloud service may be a risk for your data. As you may use cloud service to save all your critical data on services like Dropbox, Box, Sugarsync, Google Drive, Microsoft SkyDrive, Amazon Storage etc. But not sure about the data backup taken by the cloud service providers. So you have to make sure your data is available if any one of the service goes down or do not respond with better service you can still get the access by accessing another cloud service. MyBackupBox offers you the service by which you can take cloud backup. This allows you to take manual or scheduled cloud backup. 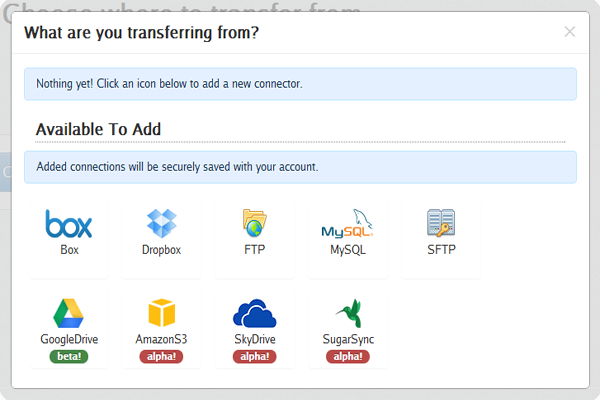 MyBackupBox even allows you to take FTP, SFTP, MySql backup to your Dropbox or any such services. You need to assign the folders and give the access and you will notice that all your files getting a regular backup which will help you to be safe on Internet. Related Post: Backup all your Tweets, Instagram and Facebook updates to Google Drive. Switch Cloud Backups: You can take backup of your Cloud services from one to another and vice-versa. You can take backup from Dropbox to Microsoft Skydrive and vice-versa. You can make combination accordingly. No software download: Since, it runs all the apps on cloud you do not need to install any software to use this features. You need to just give access to your Dropbox or cloud services account by allowing the other application to access your account. Scheduled Backup: You can transfer files directly or you can create a schedule. By creating a schedule, the linked accounts will automatically get synced up at the specified time. Website or Blog backup is easier: You can assign the FTP, SFTP and MySql database backup folders and get it backed up to your Box, Dropbox, SugarSync, Microsoft Skydrive or Google Drive. Automating the backup will make it more easier if you forget to take a regular backup. Related Post: Do not be confused while choosing your web hosting services? Version details with timestamp: Backups done by MyBackupBox, save the data with a version history and a full detailed timestamp. This creates no confusion of the dates and time the backup taken on. Check out the video to get a more detailed view about MyBackupBox. Yes, this is a very nice tool to organize all your files at different locations on cloud. You can take scheduled backup to avoid regular manual backup and spare your time on some other work. They are working on various platforms and may include other cloud providers also. I hope you enjoyed reading this blog article. Feel free to drop a comment if you liked or find something more interesting about MyBackupBox. Nice post Cyril. Thanks for sharing the information! Thanks a lot! Revisit again to stay updated. Eric, its my pleasure to post such a useful tool with rich features for my readers. Thanks for bringing such a application to us.